After kickstarting its 2017 OLED campaign with the sensational-but-expensive OLED W7, LG is now following that up with something rather more affordable. In fact, at ‘just’ £5,000 ($5,499 or AU$7,999), picking up the 65-inch version of the E7 over the 65-inch version of the W7 can save you a significant sum of money – around £3,000 in the UK or $2,500 if you live in the US. This substantial saving means you have to forego the W7’s incredibly thin and flexible screen, as well as its external control box and speaker system. However, the OLED65E7V still looks like a million bucks, still boasts an integrated soundbar that claims Dolby Atmos support, still boasts LG’s excellent webOS smart system, and still, most importantly of all, delivers pretty much identical picture quality to its more expensive sibling. Interested in buying an LG OLED E7 of your own? Here’s what you need to know. The OLED65E7 is a ridiculously good looking TV. The OLED ‘film’ is mounted onto a glass plate that’s just a few millimetres thin for the majority of the set’s rear and extends with extreme cuteness slightly beyond the picture’s outer edges. The need to build in the set’s soundbar speaker system, connections and electronics does mean the TV juts out a few centimetres further over its bottom third or so, but this detracts only a little from a truly mouthwatering form factor. Connections on the OLED65E7 comprise four 4K/HDR-capable HDMIs, three USBs, terrestrial and satellite aerial connections, a LAN port, an optical digital audio output, a headphone output, an audio line output, and an RS-232 Control port to help you integrate the TV into a home control system. Plus, of course, there’s built-in Wi-Fi, over which you can share files from other DLNA-enabled devices on your network, or stream content and download apps and games from LG’s ‘walled garden’ of online services. Design TL;DR: The OLED65E7V is drop dead gorgeous and makes even the coolest LCD TV look fat and boring by comparison. Despite the best efforts of its rivals, LG still owns in webOS what we consider to be the most friendly and easy to use smart platform in town. The OLED65E7 sports the very latest version of webOS (3.5) though, admittedly, this doesn’t differ all that much from previous versions. For the record, the new features introduced for 2017 are support for 360 VR media (you can scroll round the 3D environments using the TV’s unusual point and click remote), an enhanced zoom mode for magnifying sections of the picture, and the ability to map your favourite nine apps to the remote control’s numerical buttons. These new features join the familiar simple, efficient, colourful and slick webOS onscreen menus, as well as a strong content count that sees key streaming services such as Netflix, Amazon, YouTube joined in the UK by Now TV and integrated Freeview Play support. This latter feature means you can access the catch-up TV platforms for all the UK’s main four terrestrial broadcasters, and track down programmes you may have missed via an onscreen guide that can scroll back in time as well as forwards. Note here that the Netflix and Amazon apps support both 4K and HDR streams. In fact, the OLED65E7 will play those services’ superior Dolby Vision HDR streams when they’re available, as well as the industry standard HDR10 streams when they’re not. Smart TV TL;DR: WebOS hasn’t really changed much (again) for 2017, but it really doesn’t need to. It’s still the single slickest, most user-friendly smart system around. In 2016, LG’s OLED TVs were in most ways the kings of normal HD, standard dynamic range playback - and the OLED65E7 picks up this baton. Its stunning black level capabilities provide a near-flawless foundation for standard dynamic range’s relatively limited brightness extremes and colour tones, allowing both to achieve maximum impact. Colours look dazzlingly rich for SDR but also natural, while bright highlights take on an almost luminous – but also effortlessly authentic – beauty due to OLED’s ability to have each pixel deliver its own light. This helps the pictures look stable, three dimensional (even though the TV does not support actual 3D! ), and rich in light and tone detail. That said, we wouldn’t say the OLED65E7 does much more where SDR colour and contrast are concerned than the previous E6 OLED series TV did. Where the E7 towers over its predecessor, however, is with the quality of its HD-to-UHD upscaling. It adds more detail to HD pictures, as well as enhancing the upscaled image’s overall crispness and clarity. Sony and Samsung may still have a slight edge where HD upscaling is concerned, but it’s great to see LG closing the gap – especially as the deftness of colour and light control OLED achieves with its pixel level luminance control is beyond anything any LCD can deliver. HD/SDR Performance TL;DR: Gorgeous contrast, beautifully subtle colours and unprecedented fine light management make the E7 a joy to behold in HD/SDR. Despite its excellent HD and SDR performance, if you’re spending five grand on a TV these days you’re going to want it to also excel with the latest 4K and high dynamic range content. In previous this years this has been something of an Achilles Heel for OLED technology, due to its inability to get anywhere near as bright as LCD technology. The OLED65E7 joins the previously reviewed OLED65W7, though, in finally achieving a level of brightness high enough to help HDR shine. Literally. LG actually delivered its biggest single-generation brightness leap with its 2016 OLED screens – around a 15-20% improvement in terms of brightness according to LG. To that end, the E7 achieves a sort of HDR tipping point: it may not be the brightest show in town but it does enable the panel to deliver what now feels like a truly HDR experience. The brightness peaks that are such a key part of HDR’s impact now look much more compelling and ‘beyond SDR’, letting such HDR specialities as sunlight blazing from blue skies, reflections on metal and plastic, the glint in people’s eyes and explosions and fires look much more natural, intense and truly HDR than they ever have before on an OLED TV. It’s not just in HDR highlights where the OLED65E7 makes its new brightness mark, though. It also manages to deliver a higher general level of brightness for HDR content, underlining the sense of real-world naturalism that’s HDR’s trademark and raison d’etre. Extra luminance also helps the E7 deliver a wider volume of colour than its predecessors, which makes the HDR picture look more balanced as well as, again, more realistic. A secondary effect of this increase in brightness is that contrast-heavy HDR scenes no longer look biassed towards black like they sometimes could last year. Previously, the darkest areas of HDR images could lack shadow detail on LG’s OLED TVs, leaving such areas looking hollow and empty in a way that meant they drew too much attention to themselves. Now, improved detailing and colour response in dark areas makes them feel much more successfully integrated into the rest of the image. Not content on being brighter than before, the E7 also benefits from much-improved ‘near black’ light management versus previous OLED generations. This lets the TV produce more detail in very dark picture areas, as well as delivering better management of the screen’s overall black levels so that you no longer get the sudden infusions of screen-wide greyness that sometimes appeared with LG’s 2016 OLED range. This improved light management is a big deal when you’re talking about the extremes of light delivered by HDR content. While the OLED65E7’s colour volume still doesn’t extend as far as that of very bright LCD TVs (such as the recently tested Samsung QE65Q9F or Sony 55XE9305), the colours from LG’s latest OLED model actually look richer during relatively dark scenes than they do on those LCD rivals. This is because the OLED screen is able to produce its colours without any of the light pollution you get with the sort of external lighting systems LCD TVs have to use. Add to these outstanding strengths OLED’s viewing angle advantage, whereby you can watch it from almost any angle without its pictures losing contrast or colour saturation, and the OLED65E7V is by any measure an outstanding TV, especially for the sort of AV enthusiast who watches TV in a dark room. This brings us, though, to the first of a small list of issues with the screen. Namely, while it’s now bright enough to deliver a deliciously convincing HDR effect, it doesn’t retain as much HDR impact in a bright room as some LCD TVs. Nor, as suggested earlier, can it get bright enough to deliver the most lifelike colours when showing the brightest HDR content. These issues are especially apparent if you use the Cinema or Cinema Pro picture presets that many AV fans will want to use due to their accurate colour performance. The Standard preset’s extra brightness delivers a much more satisfying HDR picture overall, but its extra brightness introduces some quite noticeable noise in areas of dark detail and some bright areas of fine colour differentiation. In other words, none of the presets delivers a perfect picture balance. And there’s only so much you can do to try and ‘bridge the gap’ between the Standard and Cinema settings thanks to a combination of each HDR setting setting the OLED brightness option to Max and the other brightness adjustment only permitting quite limited adjustment without severely crushing out shadow detail or drastically reducing black level response. So whatever picture settings you settle on will come with a degree of compromise attached. Elsewhere, skin tones can suddenly become rather monotone and mannequin-like during dark sequences, presumably due to issues with resolving fine colour differences at certain colour ‘temperatures’. Also, while it handles motion considerably better than last year’s LG OLEDs, there's still a bit more judder and processing noise than you see with the best rivals. The OLED65E7’s pictures deserve to end on a high note, though. So we’re happy to report that if you select its Game picture preset, the TV only takes just over 20ms to produce both HDR and SDR pictures after receiving image data at its inputs. This is great news for gamers, and puts to bed the significant input lag issues LG had to wrestle with in 2016. 4K HDR TL;DR: The OLED65E7V is significantly more accomplished with HDR and 4K than last year’s OLED models. Which is a quite a feat considering last year’s 4K/HDR pictures were pretty gorgeous already. We were pretty sceptical about the OLED65E7’s audio before we started testing it – especially the Dolby Atmos claims. Partly because we just didn’t see how a true Dolby Atmos experience could ever come from a single soundbar built into a TV, and partly because it turns out that, insanely, Dolby Atmos only works from Dolby Digital+ ‘containers’. It doesn’t work with the Dolby True HD containers used by Blu-rays and Ultra HD Blu-rays, even though these sources are by far the most common source of Dolby Atmos tracks. Long story short, while the OLED65E7V doesn’t deliver any convincing sense of rear speaker information or the ‘dome over your head’ effect associated with a true Atmos experience, it does somehow produce not just a sense of verticality in the sound stage, but even a sense of quite accurately placed effects within that vertical sound ‘wall’. How a relatively small soundbar built into a TV’s bodywork can manage this is beyond us. The OLED65E7’s audio does this, moreover, without the sound stage sounding thin, incoherent or ‘baggy’. On the contrary, the sound enjoys an open, clear mid-range and an impressively wide dynamic range that combines strong levels of bass with lots of harshness-free treble detail. In a perfect world dialogue would remain a bit clearer during action scenes, but this doesn’t stop the OLED65E7 from being a strong all-around performer. Sound TL;DR: While the OLED65E7’s Dolby Atmos credentials are questionable, the set still sounds far better than the vast majority of its rivals. If money’s no object and you want a bit more 'wow-factor' from your flatscreen, you could throw £3,000 at stepping up to LG’s OLED65W7 with its sensational flexible, ultra-thin design and external audio system. A more realistic alternative, though, would be Samsung’s QE65Q9F. This costs roughly the same as the OLED65E7, but uses Samsung’s new QLED technology to deliver a wider colour range and more than twice as much brightness. Impressive screen filtering means the QE65Q9F is remarkably effective to watch in a bright room, too. This QLED set can’t deliver such profound black levels or rich dark colours as LG’s latest OLED, though. So make a decision based on your typical viewing conditions and personal image preferences. It’s worth adding that LG claims that its upcoming C7 and B7 2017 OLED TV ranges will deliver the same picture quality as the E7, despite costing considerably less, and might be worth waiting for if your audiovisual budget doesn’t have an expiration date coming up. 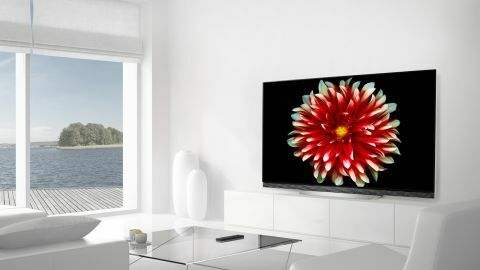 The OLED E7 is far and away LG’s most all-round attractive OLED TV. It combines a spectacular design with outstanding picture and sound quality at a far more accessible price than the ground-breaking W7. There’s still room for improvement when it comes to brightness and video noise versus the boldest LCD solutions, but crucially the picture improvements LG's OLED65E7 delivers are easily enough to finally convince us that OLED is more than ready for the HDR age.